Consider Venus with its existing atmosphere, and put a totally opaque enclosure (to incoming Solar radiation) around the entire planet at the average location of present outgoing long wave radiation. Use a surface with the same albedo as present Venus for the enclosure. What would happen to the planetary surface temperature over a reasonably long time? For this case, NO Solar incoming radiation reaches the surface. I contend that the surface temperature will be about the same as present. Now assume the gas temperature and distribution are initially different from present levels, but no gases are condensed other than those that form the present clouds. I contend the temperature will go to about the present distribution and level. The only reason for this not to not match exactly the same as the actual atmosphere would be due to the fact that for the atmosphere, outgoing radiation actually leaves from a finite gas thickness, but the present version is a surface. Assume the surface has a black body emissivity for the long wave outgoing radiation. Also assume it is a thin but good conducting material. And also answered that the opaque enclosure radiates in both directions (both outgoing to space and to the surface of the planet). 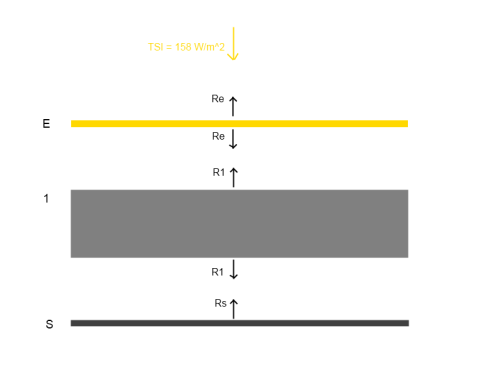 The gaps in the diagram are simply to enable us to see the radiation values from each layer more easily – they don’t represent any kind of physical discontinuity. I started with a many layer model of the atmosphere – as described a little in Venusian Mysteries. As a result of the solution to the equations, it made sense to explain a one layer model of the atmosphere first. I started by assuming that the initial conditions were that the enclosure and surface were initially very cold to see what happens. Because E is a “thin but good conducting layer” we assume that E is “isothermal” – all at the same temperature. And because it is thin we assume that it heats up quickly when irradiated by solar energy – i.e., its heat capacity is low so it doesn’t take long to reach equilibrium. Because gases have very low conductivity, and because radiation from the inside surface of the “opaque layer” is taking place, we assume that radiation to the surface is “much greater” than conductivity. In this simple (unrealistic) one layer model, we also assume that the atmosphere is isothermal (all at one temperature). This is just to get us started. We can add a many layer model later, where each layer is isothermal, but each layer is at a different temperature from the ones above and below. That is, each layer radiates the same as every other, and at the same value as the solar irradiance of 158 W/m2 (absorbed solar radiation). Which means that the enclosure layer will reach an equilibrium temperature of 229K – and this will also be the equilibrium planetary surface temperature. If these are the equilibrium temperatures what will drive conduction or convection of heat? Nothing. With the surface, the atmosphere and the “enclosure layer” of our thought experiment, all at the same temperature there will be no convection or conduction. The example above can be extended to many layers of opaque atmosphere. I checked out a 3-atmospheric layer model and the same results are obtained. (It’s tedious writing down the 5 equations and showing the substitutions to solve, especially as wordpress doesn’t do subscripts easily). But the more realistic many-layer models solve exactly the same way. So with an outer atmospheric layer absorbing the solar radiation and then heating up and radiating in to the surface (and out to space), we find that the surface is no hotter than the outer atmospheric layer. Compare this with the many layer model in the original article (under How Can the Surface Get so Hot? 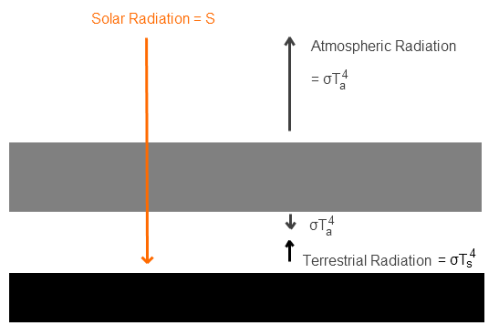 An Over-Simplified Climate Model), where, because the surface was heated by solar irradiance, the surface could become much hotter due to “backradiation” from the many layers above. Then, in that model, as a result of the high surface temperatures, convection was initiated which moderated the high temperatures. In this model, radiation can’t create those conditions – at least from a cold starting condition. [Note added, 25th June – This model is aimed at demonstrating that radiative effects through an opaque atmosphere are totally different when the solar radiation is received at the outer layer of the atmosphere compared with at the surface. The “isothermal” model of the atmosphere (=the atmosphere all at the same temperature) is just for the purposes of constructing this radiation model – and as Leonard Weinstein points out, his thought experiment explicitly stated that the atmospheric temperature varies. In a “many layer” model with low conductivity (as found in gases) the radiation model would still be valid, even though the temperature varies from night to day and at different latitudes. 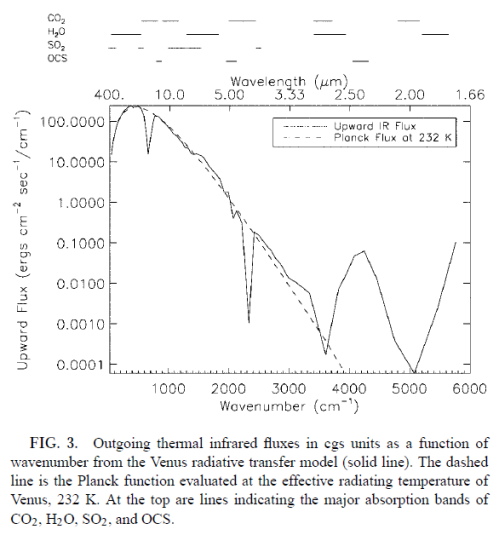 Therefore, another mechanism of significant heat transfer is required to get the surface temperature of “thought experiment Venus” (TEV) to the temperature of actual Venus. What about the Real World Effects? In practice, one half of the atmosphere is heated during the day while the other half cools, and vice-versa for the night. This doesn’t affect conduction which has a tiny effect. Does this create a stronger heating through to the surface and initiate some convective activities? How about if we started with a hot surface (from volcanic activity), would we reach a different equilibrium effect? In both of these cases, there is no explanation for why any convective lapse rate would be maintained – unless a high source of internal heat from something like volcanic activity was maintained. If we started with a hot initial condition (but no ongoing source of heat) instead of a cold initial condition, convection would simply move heat up to the top of the atmosphere until the same steady state condition was reached – where each layer was at the same temperature. Convection is the bulk movement of heat as gases or liquids carry heat from one location to another. But something needs to drive convection. In the case of the earth’s atmosphere it is the relatively high surface temperature (from radiation) heating gases which expand and so are less dense. Gases that are less dense rise – and so heat is moved more effectively from the surface than can be achieved by radiation. When heating the atmosphere from the top – with the vacuum of space above – there is no explanation for high temperatures in layers below. In the case of the real Venus we at least saw what a totally opaque atmosphere could achieve. In the case of this thought experiment we see a totally different result. Perhaps someone can produce a more comprehensive model which shows how the surface could radiate at 16,000 W/m2 in this thought experiment. I doubt that it can be done. Note 1: If we assume that the solar radiation is equally spread across all surface elements, we get the result in the 1-layer or many-layer model. Strictly speaking this is not the case – as the solar radiation only heats one side of the planet at any one time, and that somewhat unequally. Is this a good approximation? Yes, if the heat capacity of the atmosphere is sufficiently high. If the heat capacity is lower we simply get a relatively hotter surface temperature during “the day” and a relatively colder surface temperature during “the night”. 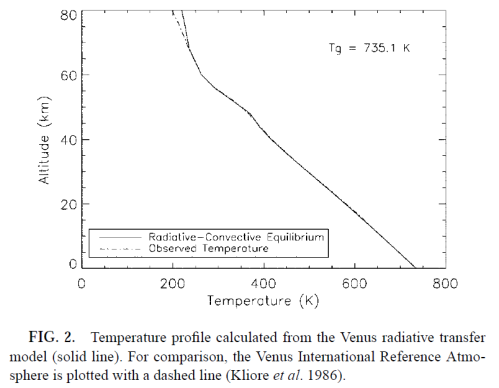 No mechanism for Venusian surface temperatures. The surface of Venus is around 730K (457°C) – why is it so hot? Although there is still much to learn about Venus the basics have some simple explanations. While earth is 150M km from the sun, Venus is only 108M km away, a ratio of 0.72. The “solar constant” (as it has been historically called) at the earth is 1367 W/m², and, as energy intensity is proportional to the square of the distance away, or “r²”, the solar constant at Venus is 1367/(0.72²) = 2,636 W/m² – Venus is closer, so it receives more solar energy per m². In any case, it turns out that Venus has a much higher albedo than the earth, with an albedo of 0.76 – meaning that 76% of the solar energy is reflected. Redoing the calculation, E = 2,636 * (1-0.76) / 4 = 158 W/m² – which equates to an “effective radiating temperature” of 230K (-43°C). The same calculation for the earth gives 255K (-18°C) – see CO2 – An Insignificant Trace Gas? – Part One. So in terms of a simple energy balance with the sun, Venus should be colder than the earth. In the case of the earth, as laid out in the CO2 series, the reason the surface of the earth is so much warmer than predicted from simple energy balance is because various trace gases, including water vapor and CO2, absorb the upward radiation from the earth’s surface and reradiate it in all directions. As some of this is downward, the surface of the earth receives more energy than it would without these gases and so it is hotter. See CO2 – An Insignificant Trace Gas? Part Six – Visualization for some more insight into this. So is Venus so much warmer at its surface because of the inappropriately-named “greenhouse” effect? Or is it for other reasons? The atmosphere of Venus is quite unwelcoming for us earth-dwellers. The atmosphere is mostly CO2 (97%), with the balance made up mostly of nitrogen (N2), and trace amounts of water vapor and many other gases in minute quantities. The mass of the Venusian atmosphere is around 100 times that of the earth, and consequently the pressure at the surface of Venus is much higher – at 92bar compared with 1bar for the earth. Now some people say that the reason for the high temperature at the surface of Venus is because of the high atmospheric pressure and the depth of the atmosphere. For example, Steve Goddard on Wattsupwiththat and echoed by Lubos Motl. This explanation isn’t one that you can find in atmospheric physics text books. This is just to explain a few basics for some perspective. 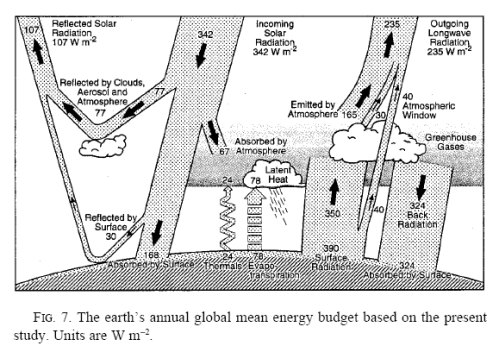 There’s much of interest in this diagram from Earth’s Annual Global Mean Energy Budget by Trenberth and Kiehl (1997) but we’ll focus on a few key elements for the purposes of this article. The surface of the earth receives an average of about 170 W/m² from solar energy (with an additional 70W/m² of solar radiation absorbed by the atmosphere). The earth’s surface also receives an average of 324 W/m² of radiation from the atmosphere. So in total the earth’s surface receives about 490 W/m² (annual global average). Now the average radiation from the surface of the earth is 396 W/m² (or 390 W/m² in the diagram above, which is close enough for our purposes). Convection and conduction remove the balance of around 100W/m². If you take a look at Tropospheric Basics you can see more about the temperature profile in the troposphere (lower atmosphere) and why convection is a more effective re-distributor of heat within the troposphere. The principal point is that the warming of the air from the surface radiation, conduction and convection causes the air to expand. Air that expands is less dense, and so this air rises, moving heat by convection. The temperature profile, or lapse rate, from convection can be easily calculated, both for dry air and moist air. Dry air is just under 10°C/km, while moist air depends on the amount of water vapor, but can be as low as 4°C/km. (And the environmental lapse rate, or what we find in practice, is around 6.5°C/km). So in the case of the earth’s surface, it would be radiating out 490W/m², but for the fact that conduction and convection remove some of this energy from the surface, and then convection redistributes this energy up into the atmosphere. This is over 40x the energy radiated from the surface of the earth – for a temperature only 2.5x greater. That’s the real world, very non-linear.. (And note that if the emissivity is not equal to 1, the energy radiated is simply the value above multiplied by the emissivity). So if we think about the top of atmosphere of Venus, it is radiating round about 158 W/m². This balances the absorbed solar radiation. And yet the surface is radiating 16,100 W/m² – does the high pressure of the Venusian atmosphere explain it? Think about it like this. For the surface of Venus to be radiating at 16,100 W/m² it has to be receiving this energy from somewhere. It receives a maximum of 158 W/m² from the sun (if all of the solar energy absorbed is absorbed in the surface and nothing in the atmosphere). The explanation from others about a temperature gradient between the surface and the tropopause (top of the tropopause or lower atmosphere) only explains anything when the surface heats the atmosphere from below. In that case the atmosphere heats up, expands and rises – moving energy via bulk movements of air. Can the atmosphere create heat from pressure and transmit this heat to the surface? In the case of the earth’s surface, the extra radiation to the earth’s surface (caused by the “greenhouse” effect) heats the atmosphere from beneath and causes convection – with a lapse rate (or temperature profile) of between 4 – 10 °C/km. And convection moves some of this heat from the surface up into the atmosphere. In the case of Venus the argument that relegates the role of the “greenhouse” effect and promotes the role of atmospheric pressure doesn’t have a heat transfer mechanism. Picture the starting condition where the surface is very cold. What heats it up? There are three ways of moving heat – radiation, convection and conduction. Conduction in gases is extremely low and anyway the top of the atmosphere is around 230K – if the surface starts off colder what causes heat to flow to the surface to create such a huge emission of radiation? Convection needs to work by warming a gas from below. Where is this mechanism if the surface is not already heated by the “greenhouse” effect? And radiation has been ruled out (as the main mechanism) in these arguments from Steve Goddard and others. Let’s take a look at the ignored radiation and the super “greenhouse” effect. How can a surface get so hot from “back-radiation”? Isn’t that just as crazy an idea? The surface receives radiation from the sun, S. In the case of Venus this value would be (averaged across the surface), S = 158 W/m². Now the surface is at Ts and radiates to the atmosphere, which heats it up. The atmosphere is perfectly transparent to solar radiation, but totally opaque in the infra-red and all at one temperature, Ta. Therefore, the atmosphere radiates σTa4 upwards and σTa4 downwards. Now with a very optically thick atmosphere, we simply add more and more layers to our model. The equations get slightly harder to solve, but each time we add a new totally opaque layer the temperature rises yet more. It should be easy to see how the surface temperature gets extremely hot from radiation with many layers of opaque atmosphere (yet transparent to solar radiation). So the Surface Temperature is Infinite, you Dummy!! Well, if we can keep adding layers, and each one just increases the “back radiation” anyone can see that this can go on forever and the temperature will be infinite! Obviously the model is wrong..
Not quite (well, if we could keep doing this, the model would be wrong). In the model above we have one totally opaque layer of atmosphere. But once we add multiple layers we are effectively dividing up the real atmosphere and saying that each layer is totally opaque. As we keep sub-dividing the atmosphere into more and more layers eventually they start to get optically thin and the radiation from the layer below will not be completely absorbed. So to calculate the effect of the CO2 atmosphere we have to solve the radiative transfer equations, which you can see in CO2 – An Insignificant Trace Gas? Part Three and Part Five (and the whole series). These are fundamental equations of absorption and emission, but aren’t really solvable on a pocket calculator – despite so many people appearing to do just that in so many blogs. Note as well that CO2 spectral lines broaden with pressure so that CO2 (and water vapor) become a much more effective absorber in the lower Venusian atmosphere than the earth’s. And we have to consider that once we have very high temperatures at the surface, convection will begin to move heat more effectively. This essentially moderates the effect of radiation. But for those who believe that high Venusian atmospheric pressure and the ideal gas laws cause the high 730K surface temperature – they have to explain how the heat is transferred to the surface so that it can radiate at 16,100 W/m². One early approach to using real atmospheric physics on this problem was by James Pollack (reference below) in 1969 who showed that that plausible amounts of water vapor and the very high levels of CO2 could explain the high temperatures – using the radiative transfer equations and a convective model. The Planck function for an “effective radiating temperature” of 232K is shown. Note that the much higher levels of flux (in comparison to the 232K curve) demonstrate that at lower wavelengths (higher wavenumbers) the atmosphere is less opaque. This tends to limit further temperature rises, as the presence of any “window” regions allows a higher surface temperature to radiate out efficiently to the atmosphere. One mental model for people new to the inappropriately-named “greenhouse” effect is to think about the sun as an internal heat source, and CO2 as some kind of insulator. Picture an ambient temperature of 20°C and a surface which has a constant internal heat source. As you add more and more insulation around this surface the temperature will keep rising – as heat is less able to flow away from the surface. For a given insulation there will be an equilibrium temperature reached that we can calculate, and it will be a function of the properties of the insulation. Even though the temperature might reach 100°C or 200°C doesn’t mean that energy is “created” in this model – and this is probably clear to everyone. Whether or not mental models “work” doesn’t change the realities of physics, but of course everyone wants to understand a subject conceptually. Venus follows the same physical laws as the earth, so explaining the high surface temperature should be possible, even though many details of the atmosphere of Venus are hidden from us. Some people who have attempted to explain the high Venusian surface temperature have used the ideas about the relationships between pressure and temperature in ideal gases without the strong “greenhouse” effect of a 97% CO2 atmosphere. However, these ideas seem to lack a heat transfer mechanism whereby the surface of Venus can radiate at 16,100 W/m². This is the missing element in ideas which eliminate or relegate the role of CO2. In contrast, high surface temperatures in very strongly absorbing atmospheres can be explained using the radiative effects. A simple model can demonstrate very high temperatures, but a thorough calculation does require solution of the radiative transfer equations. On Lunar Madness and Physics Basics, one commenter asked a very good question in response to a badly phrased answer from me. 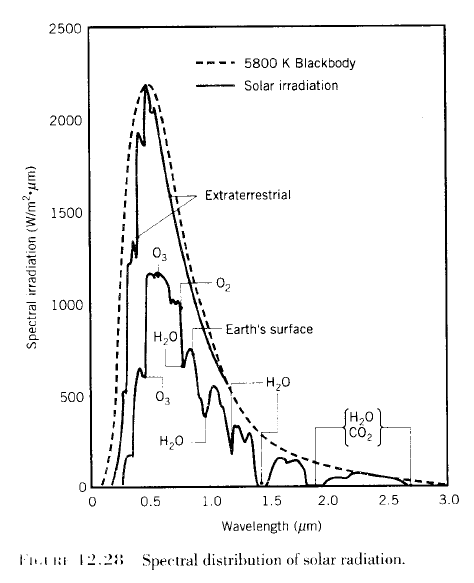 You agree that if earth had 100% nitrogen atmosphere (a non greenhouse gas), the “average” temperature of earth would be different (I’m not entirely sure it wouldn’t be lower) from the 255 K blackbody radiation would suggest. I got the meaning wrong and said “right, it would be 255K” and wasn’t very specific with what I meant, which was a mistake as the article in question had just explained everything wrong with averages.. He responded with an interesting example of a fictional Latvia, where Latvia got all the solar energy (somehow) and the rest of the world none, and showed that the average temperature of the earth was 0.5K or almost -273°C (and Latvia was quite steamy). And after I had written a comment as long as a post I thought it was probably a subject that would be worth making a post out of..
“Nice example, and I guess as I’ve been explaining everything that’s wrong with averages I should have been more careful in my explanation. The absorbed solar radiation has an average of 239 W/m2. This is averaged over the surface of the earth, which is 5.1 x 108 km2 = 5.10 x 1014 m2. The incoming absorbed energy is therefore 1.2 x 1017 W.
Note: this average of 239 is a measured value of incoming – reflected solar radiation, divided by 4 for spatial geometry reasons, see The Earth’s Energy Budget – Part One. The total of 1.2 x 1017 W also equals the TSI of 1367 W/m2 x “disc area” of the earth x (1-albedo). This is also currently the measured average outgoing longwave radiation (OLR) at the top of atmosphere, within instrument error. We’ll come to the energy-grabbing Latvia later (sorry Latvian’s wasn’t my idea). It’s a typical earth in all other respects but a cosmic being has just “hoovered up” the trace gases like CO2, CH4, NO2 and turned water vapor into a non-absorbing gas. (If water vapor was also hoovered up the oceans and lakes would be a ready source of water vapor and within a month or two the atmosphere would have the same water vapor as before). As a result radiation >4μm just goes right through it. That is the whole point about radiation – if nothing absorbs it, it keeps on going. The radiation emitted from the earth just after the Hoover incident is 396 W/m2. Or, putting it another way, the total radiation emitted from the earth’s surface is 2.0 x 1017 W.
This total radiation is calculated by adding up the radiation from every square meter on the earth. And the average is simply the total divided by the area. Note. In fact across a day and a year this value will change. Even year to year. So 2.0 x 1017 W is just the annual average across an appropriate time period. But it is appreciably higher than the absorbed solar 1.2 x 1017 W.
Who knows what kind of climate response that would generate? And the time for the total response would also depend on how well-mixed the oceans were (because of their large heat capacity), but rather than trying to work out how long it will take, we can say that the earth will cool down over a period of time. And no matter what happens to convection, lapse rates, and rainfall this cooling will continue. That’s because these aspects of the climate only distribute the heat. Nothing can stop the radiation loss from the surface because the atmosphere is no longer absorbing radiation. They might enhance or reduce the cooling by changing the surface temperature in some way – because radiation emitted by the surface is a function of temperature (proportional to T4). But while energy out > energy in, the climate system would be cooling. It’s possible (although unlikely) that all the clouds would disappear and in which case the net incoming – reflected radiation might increase, perhaps to 287 W/m2. (This value is chosen by measuring the current climate’s solar reflection of clouds, see Clouds and Water Vapor). If that happened, total absorbed energy = 1.5 x 1017 W.
However, as the earth cools the ice sheets will increase and there’s no doubt that the albedo of the earth’s surface will increase so who knows what exactly would happen. 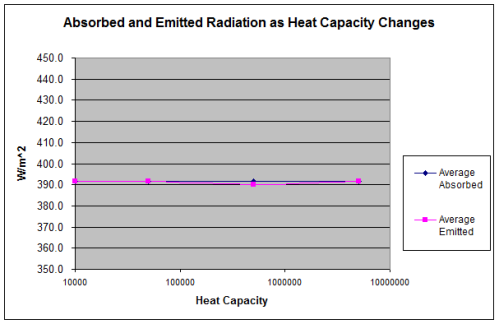 But it seems like the maximum absorbed solar radiation would at most go from 1.2 x 1017 W to 1.5 x 1017 W and more likely it would reduce below 1.2 x 1017 W.
Eventually the outgoing radiation would approximately match the incoming radiation and temperature would settle around a value – this would take centuries of course, maybe 1000s of years..
And depending on the ice sheet extent and whether any clouds still existed the value of outgoing radiation might be around 1.0 – 1.5 x 1017 W. This upper value would depend on the ice sheets not growing and all the clouds disappearing which seems impossible, but it’s just for illustration. Remember that nothing in all this time can stop the emitted radiation from the surface making it to space. So the only changes in the energy balance can come from changes to the earth’s albedo (affecting absorbed solar radiation). And given that when objects emit more energy than they absorb they cool down, the earth will certainly cool. The atmosphere cannot emit any radiation so any atmospheric changes will only change the distribution of energy around the climate system. What would the temperature of the earth be? But let’s pick the 1.2 x 1017 W as our average incoming less reflected solar energy, and so when “equilibrium” is reached the earth’s total surface radiation will be at this value. (Strictly speaking equilibrium is never truly the case, but we are considering the case where measured over a few decades the average outgoing radiation is 1.2×1017 W). Suppose that all around the world the temperature of the surface was identical. It can’t happen, but just to put a stake in the ground, so to speak. Average outgoing radiation / surface area = 235 W/m2 – (that’s because I originally wrote down 1.2 x 1017 instead of 1.22 x 1017 and so the rounding error has caused a change from 239, but it doesn’t particularly matter, more a note for those in the “rounding police”). And with a longwave emissivity close to 1 for most of the earth’s surface, this would be a temperature of 254K. As I mentioned before Latvians and Latvophiles, this wasn’t my idea. And anyway, it probably wasn’t your fault. I’ll adjust the commenter’s numbers slightly to account for the earth’s albedo. In his example, mythical-Latvia has a surface area of 10,000 km2 = 1010 m2. And mythical-Latvia absorbs all of the energy with none left for the rest of the earth. The rest of the earth is at a temperature of 0K and Latvia is at a temperature of 5080K which means it radiates at 1.2 x 107 W/m2. Therefore the radiation from the whole earth = 1.2×1017 W and so the earth is in equilibrium (with the solar radiation absorbed), but the average temperature of the whole earth = 5080 * 1010 / 5.1×1014 = 0.1K. And our commenter has nicely demonstrated the same point as in Lunar Madness and Physics Basics – you can have the same radiation from a surface with totally different average temperatures. So we have had two approaches to calculating our equilibrium hoovered atmosphere, one with a temperature of 254K (-19°) and one with a temperature of 0.1K (-273°C) – both quite unrealistic situations it should be noted. What’s the maximum “average” temperature? 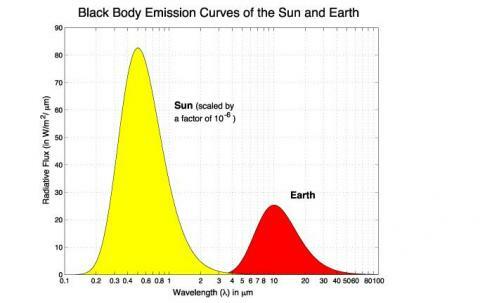 As already noted, at the wavelengths the earth radiates at (>4μ) it is quite close to a blackbody. 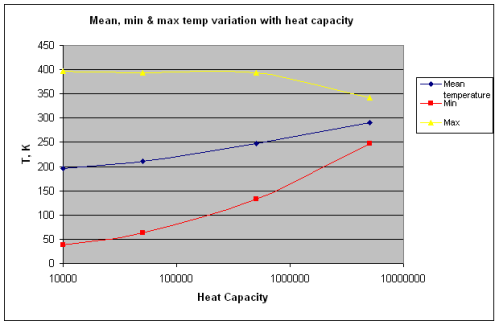 In this case, the maximum “average” temperature can’t be higher than what is known as the “effective blackbody temperature”, Teff. This value, Teff, is a common convention to denote the effective radiating temperature of a body. This is just the temperature-radiation conversion from the Stefan-Boltzmann equation, Teff = (E/σ)1/4 – the rewritten version of the more familiar, E = σT4. It simply converts the energy radiated into a temperature. So 235 W/m2 = 254K. It doesn’t mean, as already explained, that Teff is the “average” temperature. The “average” temperature (arithmetic mean) can be quite different from Teff, demonstrating that average temperature is a troublesome value. I created confusion using the concept of Teff in my comment in the earlier article. By saying the earth would be at 255K without a radiatively absorbing atmosphere I really meant that in that situation the earth’s surface would be radiating (averaged globally annually) 239 W/m2. With conventions out of the way – if the atmosphere didn’t absorb any terrestrial radiation the radiation from the surface would slowly fall from its current annual global average of 396 W/m2 to around 240 W/m2. The climate would undergo dramatic changes of course and no one can say exactly what the equilibrium “effective blackbody radiating temperature” would be as we don’t know how much solar radiation would be reflected in this new climate. Clouds, ice – and aerosols – all play a part in reflecting the solar radiation from the atmosphere and the surface, and if these change the amount of energy absorbed changes. But without an atmosphere that absorbs longwave radiation there is no way that the radiation from the surface can be greater than the radiation from the top of the atmosphere. And that means that eventually the emission of radiation from the surface would be approximately equal to the absorbed solar radiation. Therefore, the value of global annual average radiation might be 290W/m2 (unlikely), or it might be less than 239W/m2 (more likely). The world would be much colder. With an annual surface radiation of 239W/m², the “average temperature” would be -18°C or colder. On a couple of unrelated articles on this blog, people have been asking questions about the moon. This is because a lot of people have read an article called A Greenhouse Effect on the Moon from www.ilovemycarbondioxide.com that makes some confused claims. We’ve been told that the earth’s surface is quite a bit warmer than calculations predict. Theory has it that heat-trapping “greenhouse gases” account for a 33° Celsius disparity. But it turns out that our airless moon is also quite a bit warmer than predicted. The Earth is not “unusually” warm. It is the application of the predictive equation that is faulty. The ability of common substances to store heat makes a mockery of blackbody estimates. The belief that radiating trace gases explain why earth’s surface temperature deviates from a simple mathematical formula is based on deeply erroneous assumptions about theoretical vs. real bodies. A long time ago a friend told me that the way the Bank of England trains people to spot counterfeit notes is to give them real notes to spend time getting used to the feel, texture, weight and so on. They don’t give them lots of counterfeits because it’s not as effective. I have no idea if the story is true but I always thought that it was a useful concept for approaching any subject. Best to spend the time helping people understand the real theory – as all scientific “facts” are called – rather than spend 5% of the time on the real theory and introduce them to 19 flawed theories. Therefore, most of this article will focus on building understanding of the basics rather than pointing out the many flaws in the article. We will look at the temperature of a moon-like body by way of very simple models. These models are in Excel because it’s quick and easy. The concept is very simple. This is an idealized moon-like surface for illustration. For my moon-like body, we will consider one square meter of surface. This is because lateral heat flow within the surface will be extremely low and so we don’t want or need to build a GCM to solve this problem. Solar radiation is absorbed by this surface and heats up. 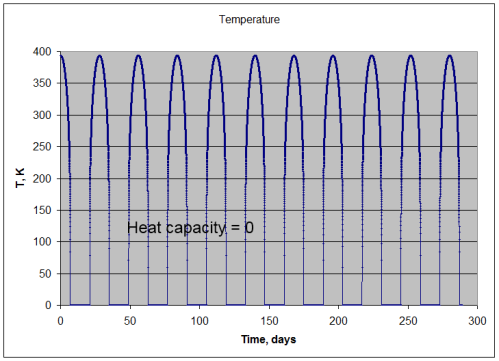 The surface has a definite heat capacity which we vary in the model to see how the results change. The sun moves slowly through the sky so the amount of solar radiation incident on the surface varies over the course of the lunar “day”. The surface has an “absorptivity” for solar radiation – the proportion of solar radiation absorbed vs the proportion reflected. When the sun is directly overhead the solar radiation incident is 1367 W/m2 and when the sun is on the horizon the solar radiation is zero – then for the whole “night” the radiation stays zero. Therefore, I’m considering the “equator”. For reasons of laziness I set the lunar day to be 28 days, but the exact value doesn’t matter. And the absorptivity was set to 0.9 (which means 90% of incident solar radiation is absorbed and 10% is reflected). Also the emissivity was set to the same value, but in this example it could be different. With different values similar results would occur but with different equilibrium temperatures. See Note 1. The simple maths for the model is at the end of the post as many people don’t like seeing equations. Now, if the surface had no heat capacity (or as mathematicians might say, “as the heat capacity tends to zero”) then the surface would instantaneously heat up until the radiation emitted matched the absorbed radiation. So during the moon-like night, the surface drops immediately to absolute zero, and during the “day” the emission of radiation exactly matches the absorption. (For mathematically inclined readers this follows a cos θ relationship – see maths section at end). Note that this isn’t like the earth or any real body. It’s just a useful thought experiment to show what would happen if the surface had no heat capacity. Energy in = energy out – so no surprises there. 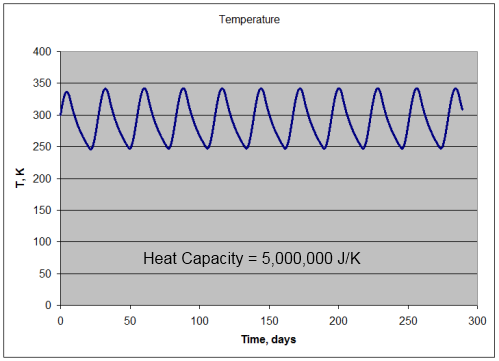 Hopefully, for most people, the fact that the temperature range is reducing as heat capacity increases is reasonably intuitive. If you want to heat up a cupful of water it takes less time than heating a swimming pool. If you want to cool down both through the same surface area it will take longer for the swimming pool to cool down. Notice that in each case the average value of absorption = emission – to within 1%. The 1% is just a result of imperfect starting conditions. If the chosen simulation starting temperature was exactly right, or there were enough “spin up” cycles to get into the steady state before the averaging was done then the absorption = emission exactly. It’s probably not surprising to anyone that absorption = emission over a set number of cycles because otherwise the overall trend in temperature would be increasing or decreasing. The reason for plotting the heat capacity on a “log” or logarithmic axis was because the heat capacity is increased by a an order of magnitude each time. Linear plots make the results of this kind of simulation less clear. The mean temperature is simply the arithmetic average of temperature over every single time step. (All the numbers added up and divided by the number of results). 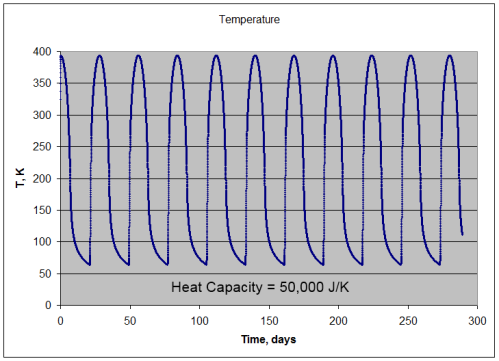 So the mean temperature does increase when the surface has an increased heat capacity! It looks like the ilovemyco2 writers were correct and the whole greenhouse effect was just a result of heat capacity of the oceans and land. Time for me to pack my bags and head off into the sunset.. But wait, hold on a minute.. If the temperature goes up, radiation must go up as well. Is there something wrong with the model? No. And for those who’ve read Why Global Mean Surface Temperature Should be Relegated, Or Mostly Ignored this example won’t be surprising. Take 3 “temperatures”: 1, 10, 100. One method gives 18x the other method – how can this be and which one is right? Also (of course) a factor of 18 between the two methods of calculating the “average”. There’s nothing surprising about this – average a series of numbers and raising the average to the 4th power will almost always give a different answer to first calculating the 4th power for each of a series of numbers and averaging the results. Now the moon has some extreme temperature ranges in the examples shown and, therefore, the “mean” temperature changes significantly. So the reason that the moon – with a surface with a real heat capacity – appears to have a warmer climate “than predicted” is just a mathematical error. A trap for the unwary. The right way to calculate a planet’s average radiation is to calculate it for each and every location and average the results. The wrong way is to calculate the average temperature and then convert that to a radiation. In the case of the earth’s surface, it’s not such a noticeable problem. In the case of the moon, because of the wide variation in temperature, the incorrect method produces a large error. So there’s no “lunar explanation” for the inappropriately-named “greenhouse” effect. In the case of the earth there is anyway a huge difference from the moon. The solar radiation absorbed at the top of the earth’s atmosphere – about 240W/m2 is approximately balanced by the outgoing longwave radiation of the same amount. But the radiation from the surface of the earth of 396W/m2 is much larger than this top of atmosphere value of 240W/m2. But ilovemyco2 – hats off to you for enthralling and exciting so many people with a simple mathematical puzzle. where Ein = energy absorbed by the surface in J/s, S = the solar irradiance in W/m2, θ = angle of the sun from the zenith, α = absorptivity of the surface at the solar radiation wavelengths. where Eout = energy radiated by the surface in J/s, ε = emissivity of the surface at the wavelengths it is radiating at, σ = 5.67 x 10-8, and T is the temperature in K (absolute temperature). This is the Stefan-Boltzmann equation. where C = heat capacity of a 1m2 surface in J/K and ΔT is the change in temperature. The assumption is that the conductivity of heat into the surface is very high with some kind of insulating layer below the “heat capacity” layer. This makes the calculation slightly easier to understand than using thermal diffusivity. And the conductivity of heat laterally is very low to avoid considering thermal equalization between adjacent surfaces. Neither of these assumptions has any significant effect on the “experiment”, or on the principles that it demonstrates. Emissivity and absorptivity are inherent properties of the material in question and are wavelength dependent. In the case of a surface like the earth, the surface receives solar radiation centered around 0.5μm and radiates out with wavelengths centered on 10μm. See, for example, The Sun and Max Planck Agree. So there is no reason to expect that absorptivity = emissivity (because we are considering the properties at different wavelengths).